The company said it has purchased three land parcels for the Water Bay luxury residential complex that will feature three 10-storey towers with around 600 apartments, a retail floor and a common basement car park extending below the buildings, with roads between the parcels. Design is well under way and construction has started with the first of the three towers expected to be completed by 2017. 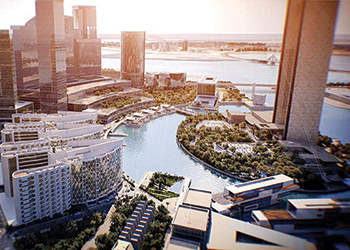 Located on the north shore and separated from the bay by the promenade, apartments in Water Bay will have spectacular views, including the Four Seasons Hotel Bahrain Bay, the new Avenues mall development and the Bahrain World Trade Centre, said Bin Faqeeh Real Estate Investment Company chairman Faisal Faqeeh. “The development will be enhanced by a host of leisure facilities such as swimming pools, gymnasia, saunas, a rooftop running track as well as a wide range of supporting and restaurant outlets. “A chauffeur service with a luxury car will be offered 24 hours to drive residents to the nearby malls and restaurants out of Bahrain Bay,” Faqeeh added. “Water Bay is a reflection of our vision and we are looking to develop real estate products in a manner that will create beneficial investment opportunities in Bahrain,” he said.